When I was growing up among farms and gardens, I loved clover and dandelions. When I asked what they were, Granny would tell me they were weeds…with a look on her face that let me know they came straight from hell! I loved those weeds though. They provided hours of fun. I made them into soup for my dolls. I fashioned necklaces, bracelets and even a crown or two. It also may be a little known fact that if you rub a dandelion on your knee, you will find out if that special someone loves you or not. The best part was I was allowed to pick as many weeds as I wanted! Weeds are remarkable in other ways as well. They can grow in the most unexpected places, right?! Out of the crack in a sidewalk or between the bricks in your paver patio. Sometimes they show up right in the middle of your newly treated green yard or among your prize roses. Granny never really appreciated that. She could accept a thorn but show her a thistle and look out! As I walked today I was drawn to the weeds. I saw my beloved clover calling me to create. 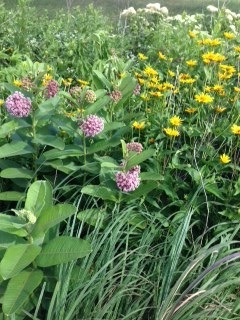 I noticed the local protected prairie garden full of beautiful weeds short and tall. They were as beautiful to me as the manicured gardens I passed by. When I walk I pray. Today I focused on the young men I will meet in my teaching assignment and in the new ministry. I have always taught students with emotional, learning, and behavioral disabilities. There have been girls in my classes but boys take up most of the seats. I have taught boys who are white, Latino, African-American and now Native Americans who are mostly Dine’ or Navajo. I pray today because last summer young Native boys far out in the deserts of Arizona had no interest in connecting with us. They sat huddled in broken down cars with their bandanas tight on their foreheads looking fierce. I recognized the blank stares. The dare to penetrate their fortress of anger. It is one thing to offer them a water in the desert and another thing to offer them education in a middle school. How will I convince these hardened hearts to find hope and healing with education. Their desires are often to be sheep herders, rodeo riders or artists. They want to stay among their people. Schools and governments often train for occupations that take you away from your people. How can they catch a vision to have a productive life and strengthen their communities? What am I really going to teach this year? I am sure the gardeners among our readers will think about metaphors for weeds that are different from mine. All the stories are important. All the gardens are under the same sun. I am choosing the weeds to tend, however. I want them to know how valuable they are to those of us who are looking to see if we are special to Someone. We have had numerous blessings over us during this journey. All of them mean so much. One such blessing was from Ginger’s Aunt Anita. In the blessing she said, “Order their steps, Lord.” We wondered at that because we feel like we are surrendering to His will now. We are finally “getting it!” But this phrase holds caution and discernment. Yes, we must abandon all to him but we must follow His directions. There is order to Plan. One place we saw this today was in regards to our non-profit. The paperwork and our dedication to the Native People was submitted last year! No word from IRS all this time. Derek would call and they would just say it was still being processed. We talked to the lawyer we paid for help and he would say everything is ok if it wasn’t returned. We tried not to worry but the time of moving is coming quickly! We need the status to accept donations and more importantly to give in ministry in a larger way. We continue to order our steps according to God’s will for us. The house is for sale but only two showings. God is in control. Katie not sure she will go with us. God is in control. No idea where we will live. God is in control. A very different job for Ginger. God is in control. We are so excited! God is in control!! Well Friends we have much to share. It took many months for us to process once we got home last summer. We knew God was calling us to the Navajo and Hopi but the magnitude of the calling was overwhelming. We have wrestled with God and each other and finally arrived at this…we are moving! The house goes up for sale May 12. Ginger resigned from her job. When are we going back? Five simple words wreaked havoc in the Sanders’ household. At the basic level, there are money concerns. At the deepest level, there are real spiritual questions to be answered. God is calling us. There is no doubt. Why aren’t we writing this from the desert sands of the reservations then? Fear. Pure fear. What will happen to our jobs? How will our adult children cope? What about all our stuff? What’s the plan? Where’s our paperwork from IRS for the 501″c3″? These questions come up and make us doubt and argue with one another. We have had moments where we don’t even know if the marriage can handle the big ramifications. I am not even mentioning the doubts about our ministry being accepted or how to prepare without making our own ministry agendas. Tough conversations that go late into the night. But God is always full of grace and love. He has gently reminded us to live in His Presence and trust in His Ways. Each day He helps us surrender over our idols and agendas. We are slowly building our faith muscles. We find ourselves saying, “when” rather than “if.” We are still waiting to hear the next steps, but we are sure there is a revival stirring in the First Peoples. We are excited to be part of it. As we drove up to the two run down homes and a very run down hogan, I noticed them. Eight to ten of them. Running, playing and eyeing us with curiosity. Kids! We stepped out of the Ford Expedition and were instantly surrounded by smiling faces. Young adult faces who recognized their friend, Paul. One went to get Mary, the old grandmother, from the house. We all stood awkwardly as Paul hugged and shook hands with those he had loved so long ago. They had families of their own now and proudly told them about their lives. They remembered Roger too and asked about his wife. They explained that they were all here because an uncle had died. The funeral would be tomorrow. The family was mourning inside one of the houses. We apologized for being here at this time but they were so hospitable. They kept saying how glad they were to have us there. I shook hands with the adults but there wasn’t a lot of warmth. The people of Dine need to get to know a person. Relationship is very important. They didn’t trust me and that is okay. I was honored that Mary asked all of us to pray for her. She doesn’t speak English and could only nod at us and touch our arms in thanks. Derek and I have found that food brings people together. Not just eating food but also talking about food. We noticed a woman making fry bread over an open fire. It was a hot day and she was working hard. We love us some fry bread so we went over to ask her about it. She was so proud of her work. She told us in broken English that she is a family friend and she was cooking for them to have food tonight as they mourned. She offered us some and I wanted to refuse knowing it was a long, hot job and that the family would need it. This would have been very disrespectful! Never refuse food offered to you by Native People. It is an insult. No matter how destitute the situation looks or how full your own tummy is, do not refuse the food! While I was enjoying the best fry bread in Arizona, one of the girls came up to talk to me. Her name is Ariella. She is in first grade this year and has no front teeth. She and I bonded in a heartbeat. She had many questions for me. Ariella helped me pass out juice boxes I had brought to the other kids. That opens up conversation really quick! Kids came out of nowhere! I was in the word prophesied to me. I was told we would go for the children. One little girl who was a bit pudgy and round-faced had a ready smile for me every time I looked at her. She would offer me whatever was in her grubby hands at the time…a puppy, a drink of her juice box, more fry bread. Our hearts were filled with love as we were embraced by these precious ones. Paul let us know that the family who was mourning invited us in to eat. We had just finished a huge meal an hour ago in Chinle! Plus, I didn’t want to take food from a grieving family. Remember our rule, however, no food refusal. Next lesson learned was even more difficult for me. The custom is for guests to eat first and alone at the table. These people didn’t know us and were giving us the first portions (5 portions at that!) without a bat of the eye! I wasn’t hungry and my heart ached as I listened to the wailing in the next room over the deceased. My custom is giving. I should be giving to them, not receiving. Heather kept me straight on my manners and I swallowed most of it. During the meal, my chubby friend came in and offered me the juicy meat in her hand. I asked her what it was? “Lamb,” she replied. “We just slaughtered it this morning.” I felt the blood drain from my body and felt a little dizzy. I could not refuse so I ate it. It was the moistest, tastiest morsel I have ever had. For real! She told me it was from the head and I was able to joke with her that maybe it was brains and making me smarter. There was that smile again! Derek said he loved seeing my new friend, Ariella, come in and just stand beside me until I put my arm around her as I ate. He could see the glow from us both as God’s plan evolved. I loved seeing Derek with the grandmothers. He would stoop down to hear their broken words and they would grasp his tan arm to steady themselves. It was finally happening. It has been awhile since we posted. Much has happened causing us to pause and reflect. We also left the reservation on July 28 to go to Santa Fe to rest and ready ourselves for the journey home. On the weekend of July 26-28 we traveled with Paul Lucero, Heather Atkinson and Roger McKinney to the Navajo Nation and specifically to Burnt Corn. Paul and Roger had done ministry years ago in this area near Pinon. Remember Pinon? The place where we felt very unwelcome? We felt good about this journey as we had an exceptional time of worship and spiritual renewal at Aztec Ruins the night before. This sacred time will not be posted as it was very intimate. Maybe in the future we will share some details but for now it is in our hearts alone. We also felt good about the journey because Paul and Roger knew where they were going! We took a normal, paved road out towards Pinon. Looking out at nothing, Roger suddenly says, “This might be it. Did anyone see the tire?” Even if I had seen a tire, there was no rode by it. “When I talked to Lorraine she told me to look for the tire.” He circled around and sure enough there was an upright tire by the side of a dirt road that read, “Burnt Corn.” We started down the red dirt road towards… nothing. I just knew from past Rez driving that we would end up somewhere after all the bumps and turns. Finally after moving around a large, washed out piece of road, Roger said, “I think that house over there is it.” He really can remember things because I wasn’t even sure it was a house! There was structure of some sort but we needed to get closer to find out. We drove into what some might call a driveway and asked two kids if they new Lorraine, our contact from over 20 years ago! Yes they did. But she wasn’t here. She was in Gallup! How about Mary? Did they know Mary? No. Paul asked the poor kids to go get their grandmother who we could see closer to the house. This is how you find people on the Rez…just keep asking. The grandmother (who spoke English; yeah!) said she knew Mary and she was over “that way.” Oh, yeah, over there where some other structures were with the horses and dogs. Everybody was over there because there would be a funeral tomorrow. What?! Yes, we were going to acquaint ourselves with these people over a funeral.